27-Jul-2013 -- This is actually my second visit to this confluence point, but the first time I did it in September 2003 I didn't have a camera handy. The first visit was shortly after Hurricane Isabel and was extremely difficult due to downed trees and my attempting to get to it from the north where the Appalachian Trail intersects Route 50 at Ashby Gap. And mud. Lots of mud. I parked at the same taxidermy shop as others have reported but no one was there. That trip in 2003 had a difficulty rating of 8 out of 10--mostly because my approach and timing were idiotic, but I did successfully visit the confluence point then. Ah, youth. Today was easier, maybe a 5. It was a snap decision this morning to do this trip--completely unplanned. This time I drove to Sky Meadows State Park and walked up the mountain along the Ambassador Whitehouse trail to the Appalachian Trail, where I turned left (south) briefly to get to the Old Trail. I had largely forgotten how I did it before, but once on the Old Trail I remembered how I picked up a westbound vehicle-way of some kind that was navigable but mostly overgrown--no cars or trucks had been on it evidently for many years. This vehicle-way might be the Pipeline some people here are referring to, although I did see another wider/straighter clearing with "Danger - Natural Gas" signs on it which I thought was the Pipeline. This path brought me to the clearing with the now-famous old homestead/chimney at N38 59.889 W77 59.914. I proceeded 50 meters or so from there before heading north into the brush for the last 40-50 meters. Like a dork I neglected to wear long pants, so I have some plenty scratched up legs from the thorny vines to show for it. 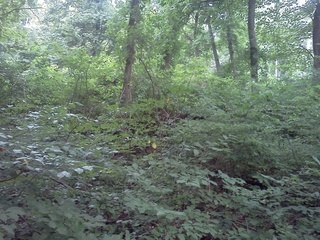 I think I'm lucky not to have any poison ivy as I believe that is indigenous to this area. The weather today was almost perfect for a 2.5 hour hike, about 70 degrees with a light drizzle on the return downhill trip to the car. I doubt I have seen more butterflies in a single day than today and this was definitely not a trip for anyone who's afraid of spiders. Those are bad but I'll take them over mud any day. For about 1.5 hours during this trip I was completely alone, although I did hear occasional gunshots, I'm guessing deer hunters perhaps a mile or two southwest of the confluence point. The confluence point is mostly as I remembered it from ten years before. It was 5 meters from a relatively clear area roughly equidistant from three trees. I examined those three trees and two more in the general area and did not find any plaques nor any sign of human visitation, although I feel fairly certain it's the right location because it matched my memory of it before. I neglected to note the accuracy of the lat/long, so I'm forced to report the maximum 100 meters for the error, though I feel confident the error must be less than 10 meters given I came to almost exactly the same spot using very different equipment--the first time in 2003 I used a Magellan handheld GPS. My GPS this time is an LG Optimus V phone with an app called GPS Essentials, a free Android app that provides, among many different things, a dashboard that shows at a glance lat/long, altitude, speed and # of satellites being used. The app also has a compass-like capability where you plug in a lat/long and it tells you how far and in what direction you need to go--much, much easier than alternately finding latitude/longitude lines in a weird version of Battleship. I did not bring a separate camera and so, my phone not being able to take a picture of itself, I took a screenshot of the display at the confluence point. Hope that's acceptable. I will probably come back in a year or two, a little better prepared and with error estimation turned on so I can triple-check it's the right spot. I'll also bring something to leave there for others to see--I like the idea of a plaque. I wonder whatever happened to the other one? #9: The old homestead from the east side. Someone left a nice ladder against it. #10: Screenshot of the "all zeroes"
1000 ft from the Appalachian Trail.